They establish magazines, make films and organize festivals: many refugees make an active contribution to the cultural scene in Germany. Ramy Al-Asheq has opened seven doors: one is “The Door to the World” which features international news. Another is “The Open Door”, providing handy tips about life in Germany. “Her Door” reports on the latest issues from a feminist perspective. And “The Door of the Heart” presents stories of hope, love and success, something which Al-Asheq believes refugees all too often lack. These “doors” are sections in a magazine entitled Abwab, which the 26-year-old Syrian Al-Asheq has run as editor-in-chief since December 2015. The first ever Arabic-language magazine in Germany, it has appeared once a month ever since. “Because a door to German culture has already been opened to me, I now want to hold it open for other refugees”, explains Al-Asheq, who lives in Cologne and came to Germany in 2014 on a Heinrich Böll Foundation scholarship. He and his team now already have nearly 25 pages on which to achieve this – for the most part in Arabic. “Most refugees do not speak any German yet”, says Al-Asheq. He goes on to explain that social networks are full of incorrect reports, which is why Abwab features not only news from the refugees’ home countries but also many issues relating to Germany. In the January 2016 issue, for example, a female Syrian author wrote an article about sexual assaults following the incidents on New Year’s Eve in Cologne. Abwab is now distributed free of charge to more than 100 refugee housing facilities, Arabic cultural societies and adult education centres. Printing is financed out of advertising revenue, and the more than 30 authors and journalists involved so far work on a voluntary basis. Al-Asheq, a poet and writer who has already published several books, also wants to help on other fronts, however – by setting up a trilingual German, Arabic and English website for refugees and anyone else interested, and by organizing workshops and discussion events; in short, by creating platforms which provide information and allow networks to form. He explains that he has just met with representatives of a number of German ministries, and that he also receives regular enquiries from countries such as Sweden, Greece, the Netherlands and France. All of this makes Al-Asheq feel hopeful about the future. After all, he says, particularly refugees from non-European countries need more support at first to help them settle into their new life in Germany. “Someone from Italy or Greece does not need the same kind of help that a refugee from Syria or Eritrea does”, he believes. Which is why he urges people “to talk not about us but with us.” His brother arrived in Germany a few weeks ago, and Al-Asheq’s first piece of advice for him was: “Meet Germans and speak to them – even in bad German or English.” Al-Asheq believes that people who hold doors open for one another can learn from one another. Firas Al-Shater, who fled the civil war in Syria almost three years ago and now lives in Berlin, demonstrates that this can also be done with humour. Al-Shater was a filmmaker back in Syria and has not given up on his vocation in Germany either. He has launched a series of videos on his website Zukar.org – made by refugees for refugees, in German and with a slightly comedic touch. His first video, in which the filmmaker gets passers-by to hug him on Berlin’s Alexanderplatz, made him a YouTube star. Its title was: Zukar 01 – Who are these Germans?. The Munich-based “Kino Asyl” (i.e. 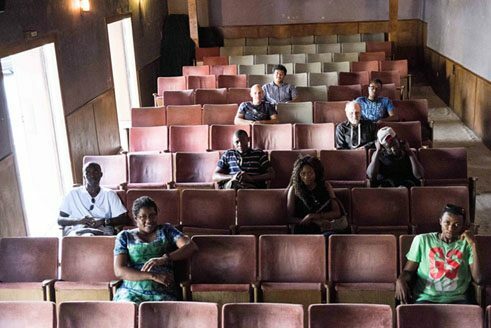 Cinema Asylum) project shows how refugees can also open a window onto their homelands and thereby contribute to an exchange. Thomas Kupser, a media educator from the Medienzentrum München (i.e. Munich Media Centre), had the idea in 2015 of establishing a festival featuring films from the home countries of refugees in which they show where they come from and what has influenced them. He quickly found people willing to help and drummed up financial support. Refugee institutions got in touch and proposed young participants. This is also how Ansumane Famah came to be involved in the project as one of its ten curators. “Aminata, the film I chose, reflects to some extent my homeland of Sierra Leone”, says Famah, who has lived in Germany since November 2014. He did not pick a light-hearted theme: Aminata tells the story of the daughter of poor parents who wants to obtain a good education but is forced into marriage at the age of 14. She nonetheless continues to pursue her goal of a better future. Nicole Sagener lives and works as a freelance journalist in Berlin. She writes for publications such as “Zeit Online” and “Tagesspiegel”.